Elsevier has published an extensive survey of attempts at building commercial Vertical-Axis Wind Turbines on its digital platform. The print version of the survey by Swedish academic Erik Möllerström will appear in the May 2019 issue of Renewable and Sustainable Energy Reviews. 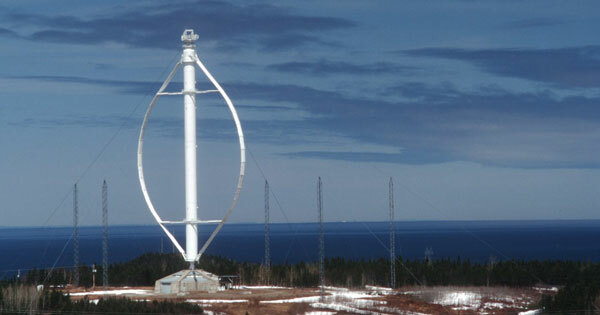 Titled "A historical review of vertical axis wind turbines rated 100 kW and above", the journal article traces the development of commercial-scale VAWTs from the revival of wind energy in the 1970s to the present. Unlike many academic articles that can only be read behind a pay wall, the historical review is openly accessible and available for download. Möllerström, who wrote his doctoral thesis on one of the turbines mentioned in the review, unearthed original material on little-known VAWT projects in Europe and North America during his research. He also tracked down some of the principals from pioneering projects, including Paul Vosburgh of VAWTPower and Albert Watts of Canada's giant Darrieus Eole. Vosburgh led Alcoa's ambitious Darrieus venture in the early 1980s. He was Mr. VAWT in the day. When Alcoa abruptly cancelled its program after an embarrassing failure of its flagship turbine near Palm Springs in 1981, Vosburgh spun off the technology, forming VAWTPower. 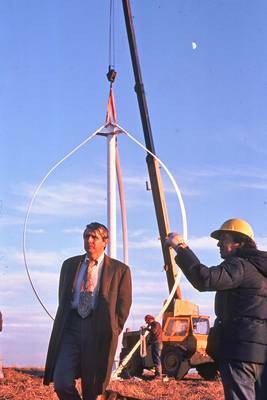 Vosburgh led the company to install 40 Darrieus turbines in the San Gorgonio Pass between 1983 and 1984. Watts led the research arm of Hydro Quebec and was the driving force behind erecting Eole in 1984. 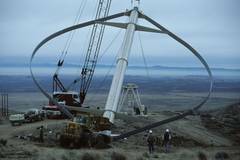 Still to this day, Eole was the largest Darrieus wind turbine ever built. 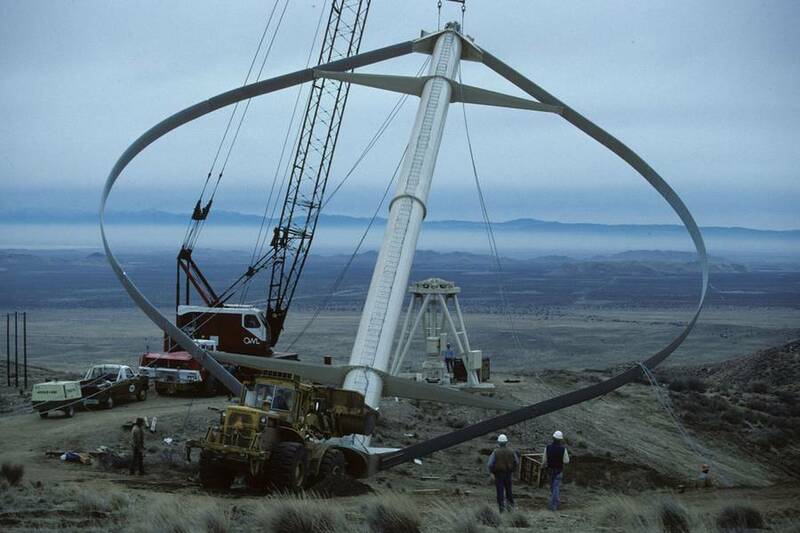 The turbine operated for nearly five years in continuous service from 1987 to 1993 when Eole was taken off-line. The turbine is still standing, though now used only as a tourist attraction and a venue for techno music concerts. Currently, Möllerström is a senior lecturer of Energy Engineering at Halmstad University on the west coast of Sweden. Halmstad is equidistant between Malmö and Göteborg. I've written frequently about VAWTs, nearly always critical, and I devoted a whole chapter critical of VAWTs in my new book Wind Energy for the Rest of Us. So I was more than a little surprised when Möllerström asked me to join him in his project. Nevertheless, the challenge intrigued me and I signed on. I was in good company too, as Möllerström also solicited the participation of Jos Buerskens, formerly the director of wind energy programs at the Energy Research Centre of the Netherlands and a long-time colleague. Möllerström has made a major contribution to the history of wind energy by collecting obscure data on major as well as minor VAWT programs in a branch of wind energy that is often overlooked if not shunned by professional wind engineers. He has documented this once-promising field while some of the principals were still alive and gathered technical data on these forgotten projects--data that were obtained at such great cost. Importantly, Möllerström has put this information in the public domain for the benefit of researchers today, and those of tomorrow.